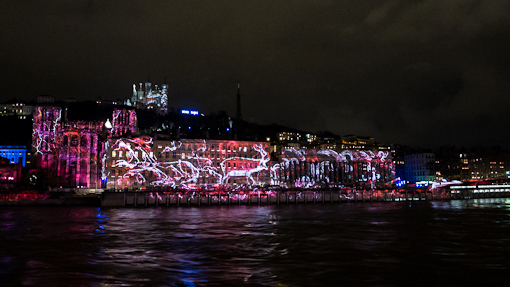 This is the last of a series of posts on the Fête des Lumières at Lyon. 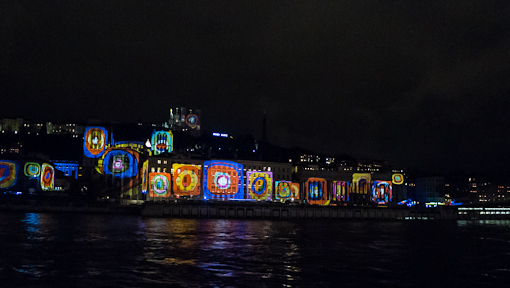 As we mentioned before, there were many light shows and installations all over the city and we only managed to catch just a handful of them over the weekend. The show on this famous hill side must be one of the most widely watched. Fourvière is the hill immediately west of the old part of Lyon (Vieux Lyon), rising abruptly from the bank of river Saône. It is primarily known for the Catholic Basilica of Fourvière and a tower (Tour Metallique). The photo below was taken during a short intermission. 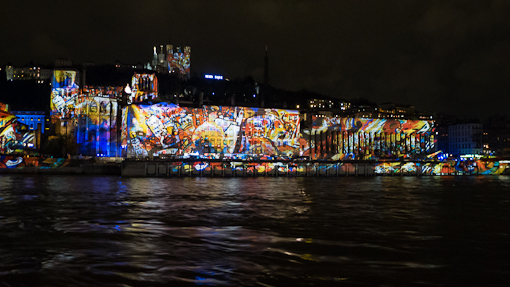 The projected images were static and appeared to be the works of several 20th century artists – we think the works of Klee, Kandinsky and Miro (and others) were projected. The inauguration of the golden statue of the Virgin Mary on the north-west tower of the Basilica is the origin of the Festival of Lights. Fourvière contains many religious buildings including convents, monasteries and chapels. The basilica has always been a natural focal point for the city. 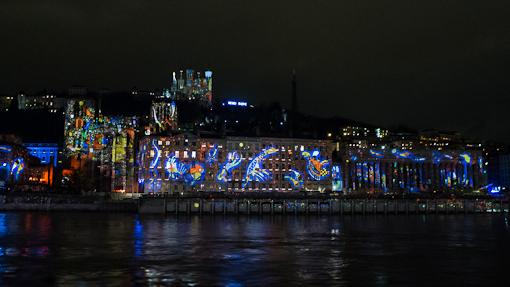 During the festival, the buildings along the river front, the apse of the Saint Jean cathedral and the Palais de Justice as well as the basilica served as a canvas for the projection of images. 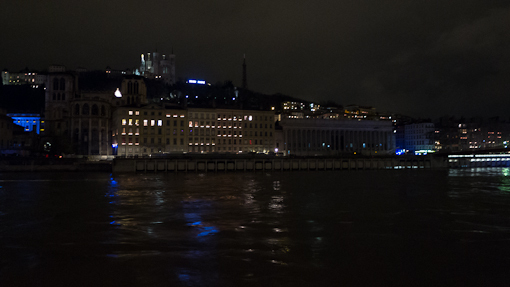 There were crowds three or four deep standing along the river bank – Quai des Celestins. It would have been nice to see this from a boat – getting closer but not immediately below the projections. What surprised us was the lack of boats. Presumably, the city banned them for the evenings. 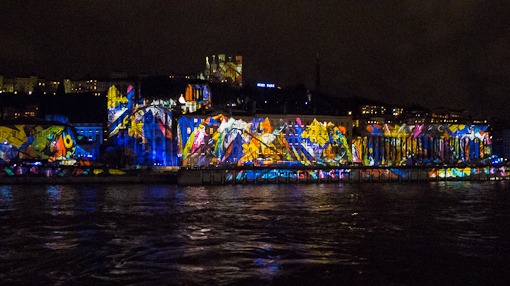 The lights from the boats could mar the projected images for those watching from afar. 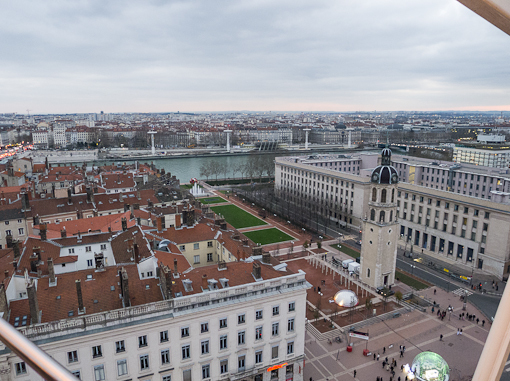 Here is a bird’s eye view of Lyon from Fourvière with the old town and river Saône in the foreground (the picture below was borrowed from Wikipedia). 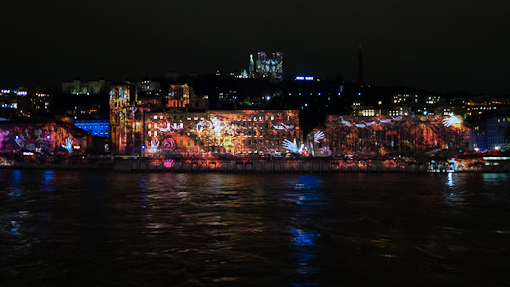 The pictures of the projections were taken while standing on the far bank of river Saône near the trees on the left. 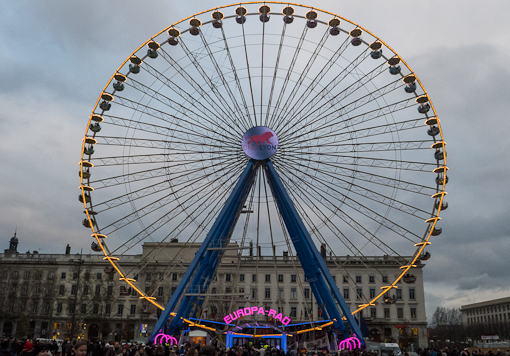 A Ferris wheel was set up in Place Bellecour during the Festival of Lights (Fête des Lumières) in Lyon – the Europa Rad. We waited until dusk before getting on the wheel because we wanted to catch a bit of natural light along with the decorative lights. Here’s a short clip of the views from the top to the bottom and then going back up. The video is 51 seconds long, so the wheel was turning at approximately 1 cycle per minute. 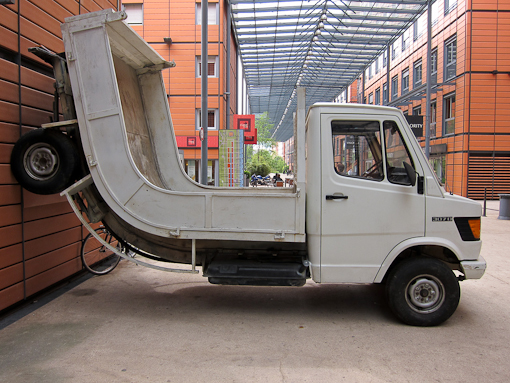 It was a gentle ride – a bit short though. Southwest corner of Place Bellecour. Looking west with the Basilica de Fourvière and metal tower in the background. 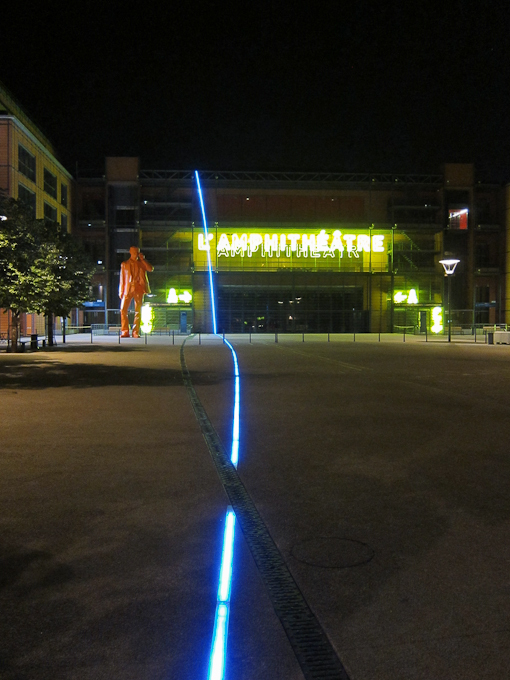 Also visible are the banks of the river Rhone. Les Trois Domes at the Sofitel where we had lunch earlier (see post here) is just visible near the top right hand corner. The domes that gave rise to the name of the restaurant are located on the Northeast corner. This is an “uptown” view looking towards the city center. 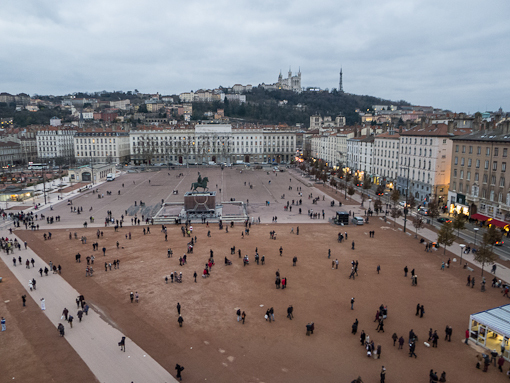 To me, Place Bellecour is the equivalent of Union Square in NYC. We were near the top which was about 55 meters above ground. 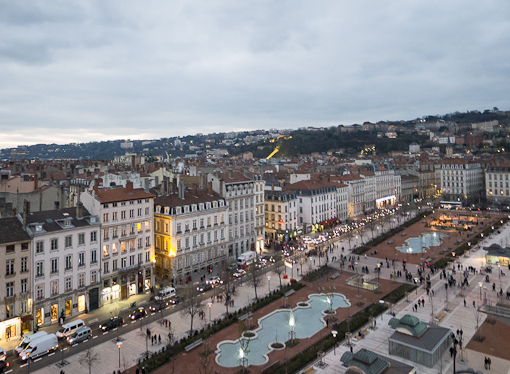 One of the main streets – Rue Edouard-Herriot starts here (lower right hand side) – the “5th ave” of Lyon. 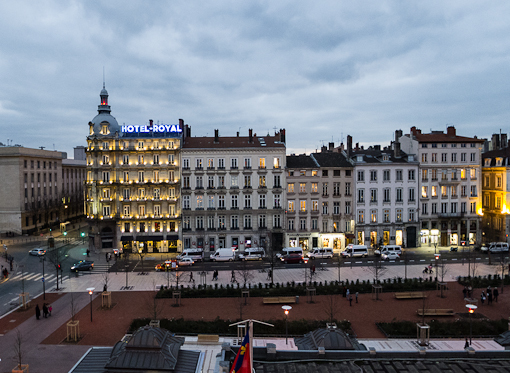 Hotel-Royal at the Southeast corner of Place Bellecour. 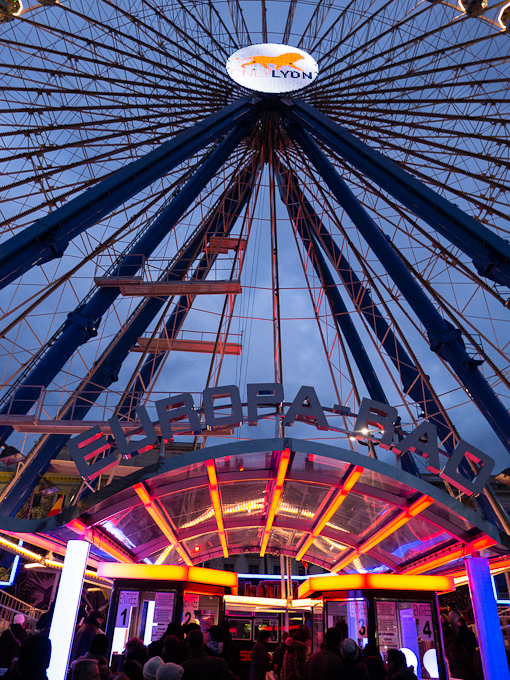 The Europa Rad claims to be the biggest transportable Ferris wheel with open and swiveling gondolas. We seem to be starting a tradition of getting on a Ferris wheel wherever we see one – in 2012 we had already been on a Ferris wheel – the Riesenrad in Vienna – see my post about the Viennese wheel here. 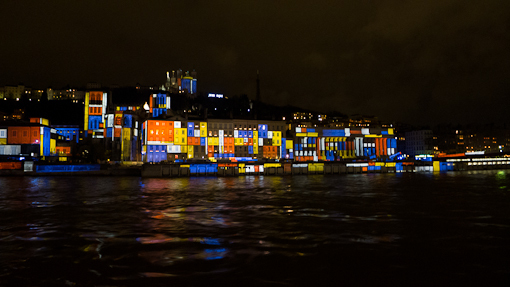 During the four days of Festival of Lights in Lyon, there were 62 listed shows or exhibits scattered around the city. 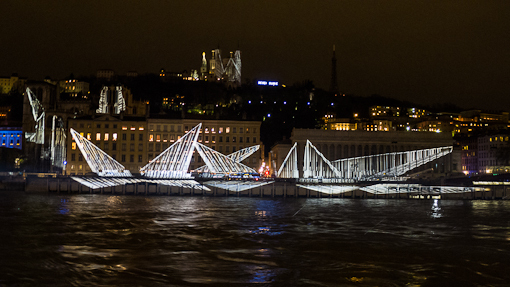 We spent the weekend of December 8-9 in Lyon (see earlier post here). 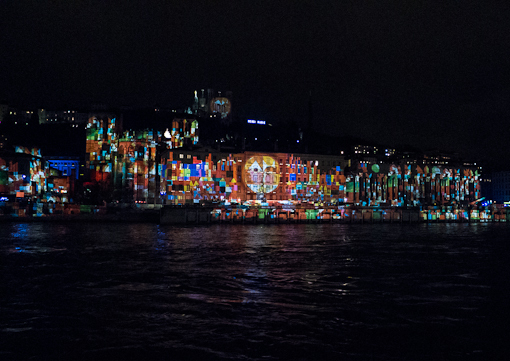 Many of the buildings were lit up, some had projected static images, and a few played moving video clips. Théâtre des Célestins was the site of a show called “Lumieres Archipicturales” which was based on the idea of an artist working on the facade as if it is a painting. Here is a short segment of the animated show with music. My fingers were frozen towards the end. This video is about a minute long but the entire show is about 5 minutes. The show was being repeated continuously so there was a constant flow of people. 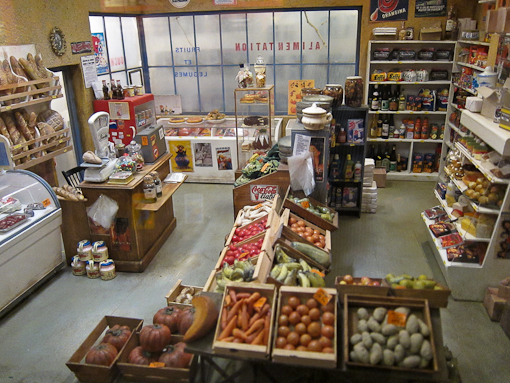 Our friend F who went to school in Lyon wanted to see this particular exhibit despite the crowds. The small garden with a fountain in front of the theater was packed with people. When we first got into the square, the show had already started. After the show was over, we moved into a better viewing position and saw the show again. 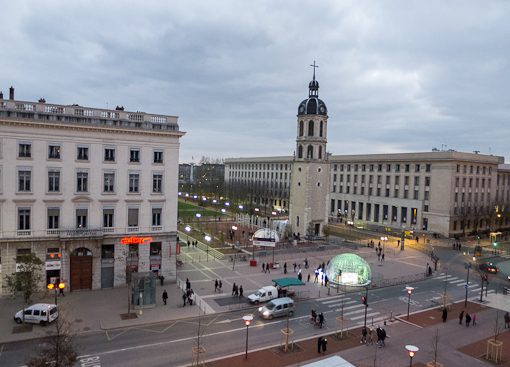 In a nearby area, we saw the Corazon (Heart) at the Place de la Bourse. The bars of light on the heart change with the sound of a heartbeat. This is Rue de la Republique which is one of the main streets for shopping that runs through the city. 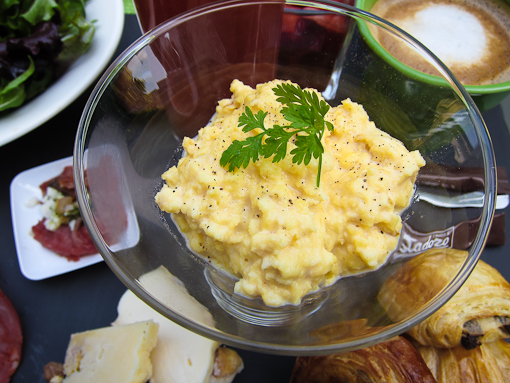 Lyon is well known for food. On our visit during the weekend of the Fête des Lumière, Sue booked for the four of us a table for lunch at Les Trois Dômes in the Sofitel Bellecour. This is how the hotel describes itself online. 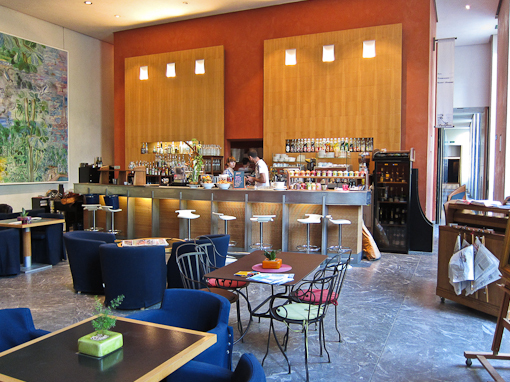 The dining room is located at the top floor of the Sofitel, just round the corner from Place Bellecour. The name of the restaurant presumably comes from the view of these three domes. The dining room has a black, white and silver themed decor. The English translations are taken from their website and some of the descriptions sound a bit odd. Poitrine de Cochon Fermier Caramélisé, Palet de Choux et embeurré de Foie gras (Caramelized Breast of Free Range Pork, Cabbage Puck Simmered with Foie Gras) This is my(Chris) main dish, the puck was really amazing, much better than the flavorful but slightly dried pork. How was Norwegian omelette translated into baked alaska ? or was it the other way around? The panoramic windows afforded a view of the Fourvière hill with the “metallic” tower and the basilique Notre Dame de Fourvière. Across the river Rhône is the swimming pool complex built in the mid 60’s, Piscine du Rhône. A Ferris wheel was set up in Place Bellecour which we went on … see our later post. It was a nice long lunch. And then we went to do some Christmas shopping. 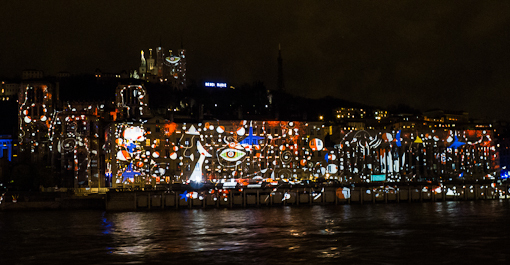 Over the weekend of Dec 8-9, we went to Lyon for the annual Fête des Lumières. 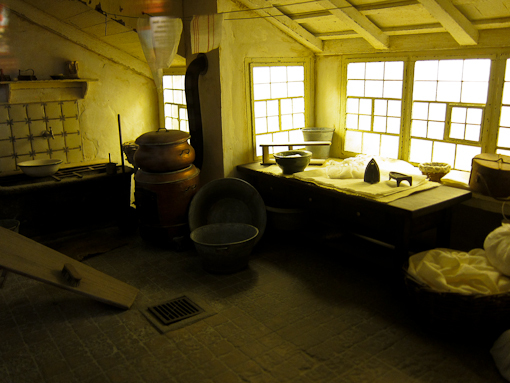 The Festival of Lights is a uniquely Lyonnaise tradition which requires that every house place candles along the outsides of all the windows. Dating from 1643, it was meant to be a tribute to Mary if Lyon was spared of the plague. The light show at Place des Terreaux was one of the main event of the festival and it has got to be the most crowded place. The atmosphere in the square reminded me of new year’s eve in Times Square, NYC. Hope you enjoy the video – I(Chris) stood in the cold, raised my arm up for 6 minutes to make this. 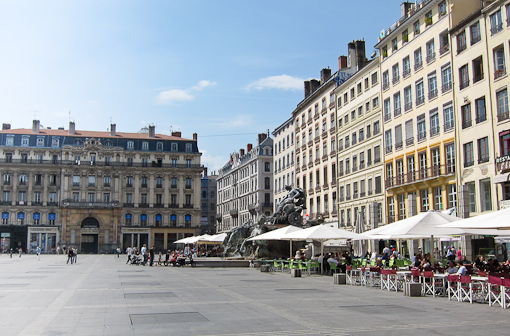 The Place des Terreaux is located in the centre of Lyon on the Presqu’île between the river Rhône and the river Saône. Although it was cold, it was not snowing or raining on Saturday night. Much of the show was built on having giant dancers interacting with architectural elements on the facade of the buildings and the idea of light being something tangible that can be handled by the dancers. 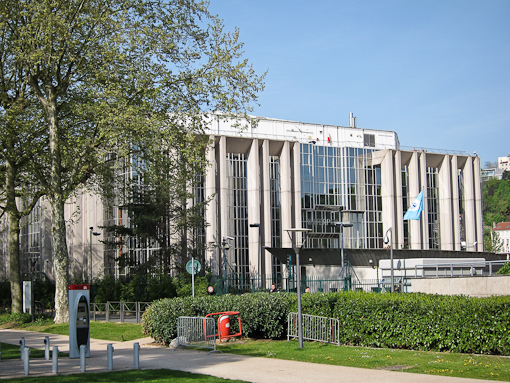 The square is bordered on the east by the Lyon City Hall (below). 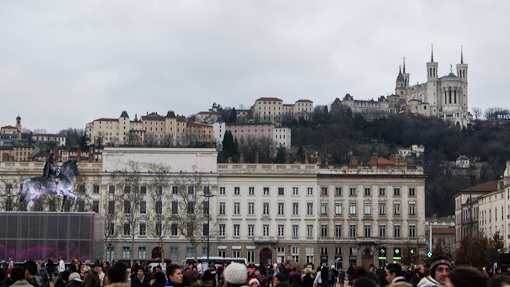 On the south of the square is the Palais Saint-Pierre and the Musée des Beaux-Arts de Lyon. 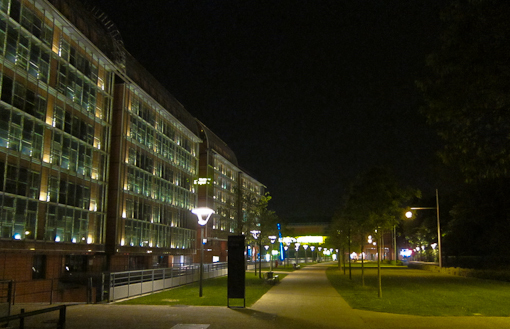 This building has the largest facade which served as the main space for the show. 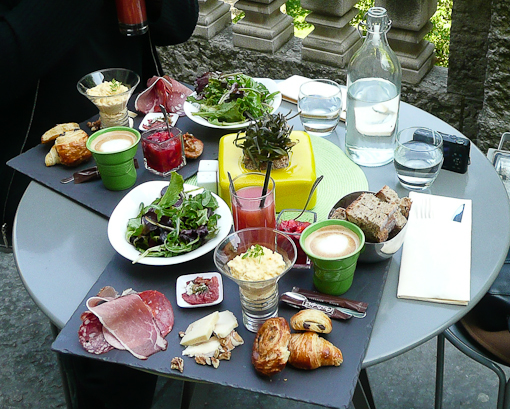 The last time we came to Lyon, we had a leisurely sunday brunch on the patio of this museum – see this post: Les Terrasses Saint-Pierre. We saw the light show twice at two different locations in the square, once in front of the entrance to the Musée des Beaux-Arts (where the video was shot) and then at the northwest corner in the direction of our apartment. All the hotels were booked for the weekend but our friend F went to school in Lyon and has local friends who found us an apartment within 5 minutes walk from the Place des Terreaux. How convenient! The effect of bouncing light around and between the buildings worked well. Night and day. 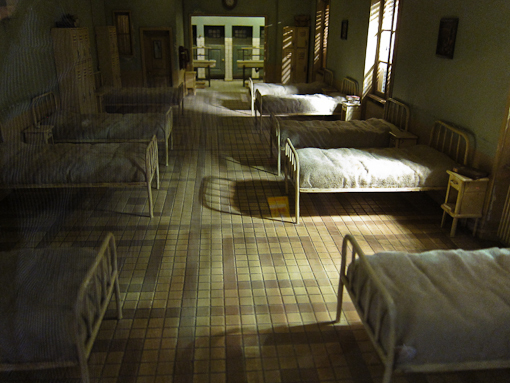 This is what the Place looked like the next morning. Shot from the same position as the night photos. You cannot see clearly the spectators in the photos, but there were 1000’s of heads in the square. When one show was finished, the crowd moved towards one corner of the square to exit, and the next group enters the square via another corner. To direct traffic, the exit (sortie) signs were projected onto the buildings next to it. Sue: There was a bottle neck at one point (see photo below). Chris was holding me back from moving forward because he was afraid of stampede. He kept on saying “Sue come back here! Don’t move. It can be dangerous. There is no place for the people in the front to move.” Of course, there was pushing and shoving. There was this group of people (about 6 or 7 of them) that was pushing their way forward and I was being shoved sideways. Chris grabs my coat to steady me and says “those people are fu*kers” OUT LOUD. LOL. You should have seen my face. Now, I don’t care that it’s in France. People will understand that word. I was annoyed enough to say “fu*k it, I’m going home”, but when Chris said that, I just started to crack up. Later on when I was telling this to our friends, Chris had no recollection of ever saying it. That was funnier. We passed the same street on Sunday morning less than 12 hours after the photo above was taken. 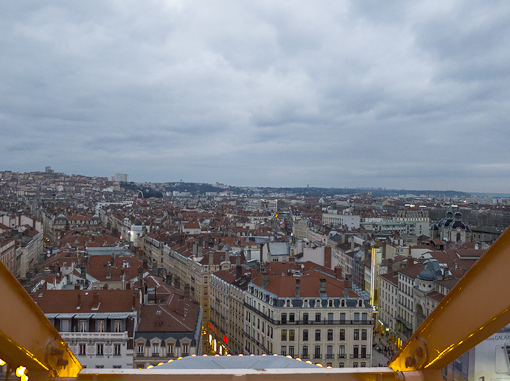 More Lyon pictures to come in our next few posts. 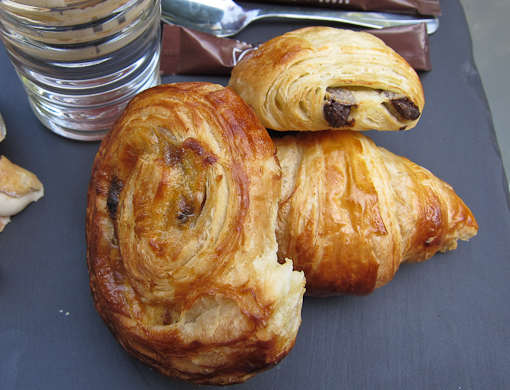 The word “Bouchon” in French has several popular meanings. 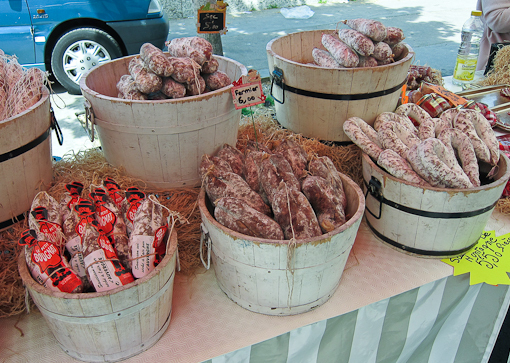 Looking it up in Larousse, the word bouchon means, among other things, a “plug” (1. 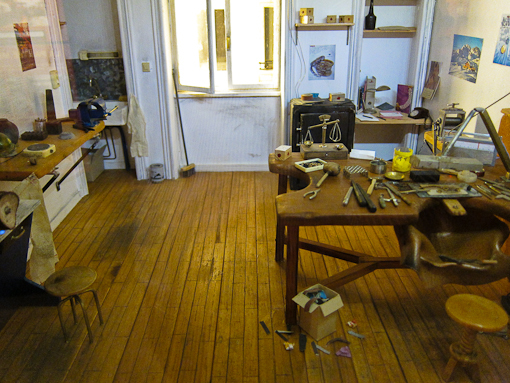 Objet qui, réalisé en diverses matières (bois, liège, plastique, métal, caoutchouc, etc. ), sert à clore un contenant), and a “traffic jam” (2. Accumulation de véhicules qui gêne la circulation ; embouteillage), etc. ; and according to Wikipedia, “A bouchon is a type of restaurant found in Lyon, France, that serves traditional Lyonnaise cuisine, such as sausages, duck pâté or roast pork”. In one recent weekend, we managed to appreciate almost all these meanings. 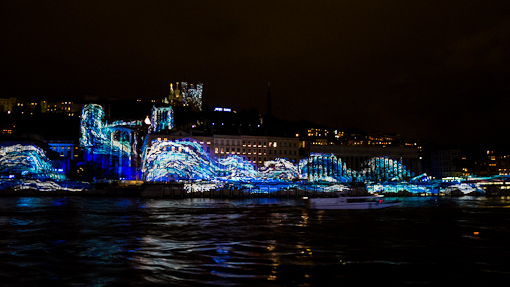 It all started when we decided to see the annual Fête des Lumières (the Festival of Lights) in Lyon (see next posts for more pictures). Leaving after work on Friday night, our friend F drove four of us to Lyon. It is normally a drive that is about two and a half hours from Lausanne. But snow started falling around Friday noon and did not stop. After some hesitation and studying the live traffic information on Google Map, we decided to take a chance. And – we were punished, it took us three hours to reach Annecy which is only about one third of the way. The traffic radio kept saying there is a bouchon here and there… everywhere… essentially start and stop traffic as soon as we crossed the border. We stopped for dinner in Annecy hoping the volume of traffic would thin out. The roads were empty by midnight so we continued to Champery, eventually reaching Lyon at about 130 AM. We were in a bouchon (#1) for more than three hours. Back at the apartment (which we had for the weekend), we discovered that the cork was so dry that it was impossible to remove it. Using a corkscrew and a knife, F struggled with the bouchon (#2) for a good ten minutes before giving up. In the end, we had to break it. There were bits of bouchon in F’s glass – see the floating bits ? On Saturday, we walked around the city to see the lights and wandered into the touristy district where the bouchon-style restaurants can be found. Many of the restaurants put a table outside selling hot food and warm wine, and blocking half the street. The food and wine attracted crowds who stood there sipping the alcohol, effectively plugging up the narrowed streets. Sue: Many of the four million tourists on that day had the same idea and the narrow streets in the area were packed. So, there was a lot of pushing and shoving going on. One dude was playing the “guard” by having his back to the people and literally shoving people out of the way for his group to move forward. When he got to me, I (Sue) elbowed him. Sorta hard and pushed back really hard. He actually turned to look at me. I was this close to saying “WHAT? I’M FROM NY, WANNA MAKE SOMETHING OF IT?” Maybe it showed on my face? He turned back and walked away. From that moment on, I was seconds away from F-bombs flying left, right and center – Lol. We were in a human bouchon (#3) while looking for a bouchon-style dinner (#4). 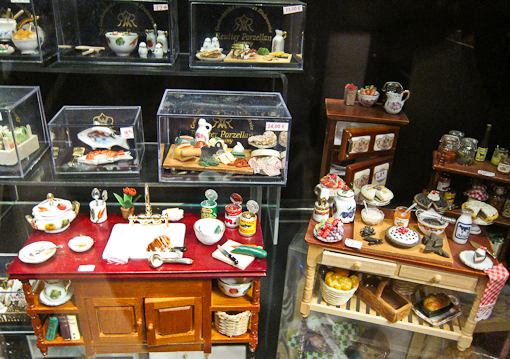 In the end, we went to one of a chain of kaiten-zushi restaurants (回転寿司, restaurant that serves sushi on conveyor belt or restaurant japonais de type comptoir tournant) – Matsuri Presqu’île (7 rue de la fromagerie) – in addition to the usual fare, they put macarons on the conveyor. As it was so cold walking around in the wind and with snow on the ground, the plates of sushi were not enough and got us thinking about noodles which were not available in Matsuri. 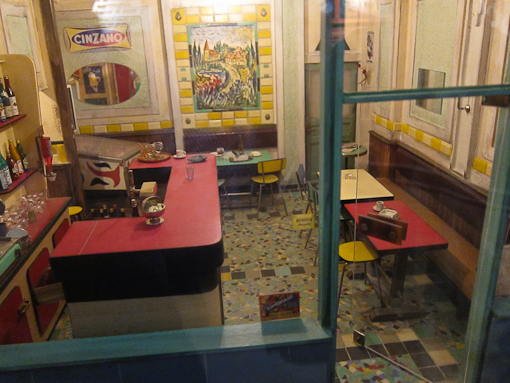 When we finished, we crossed the street, turned a couple of corners and totally by chance stumbled across a fast food-takeout noodle joint on 12 rue Neuve – Goramen! We stepped in and had our second dinner of miso ramen and tempura udon. Here’s the menu – goes from shio ramen, tantan mien to kimchi ramen, etc. while the place looks like a McDonald, the service was anything but “fast”. There will be many more pictures of food and the light shows to come, come back in a few days time. 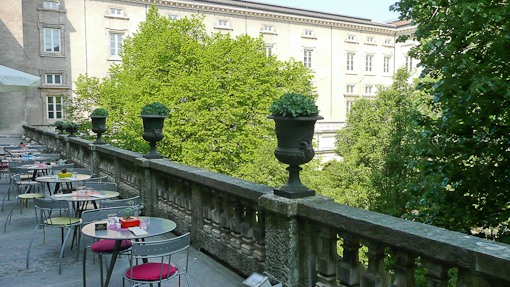 Les Terrasses Saint-Pierre is located inside the Musee des Beaux-Arts. 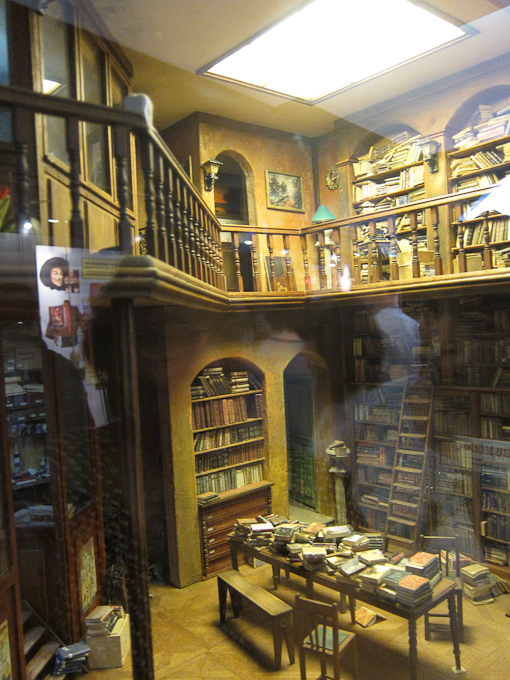 It is on the second floor and has seating inside and outside. 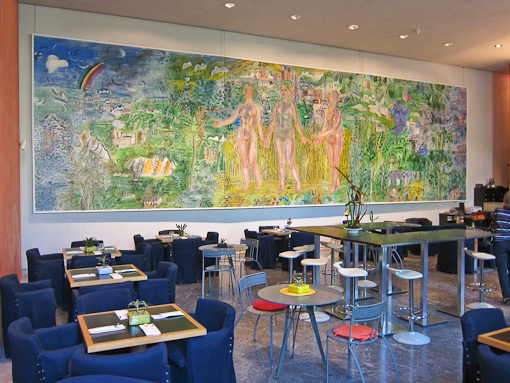 The interior of the cafe has a giant mural by Raoul Dufy, a painter/illustrator whose works I liked. 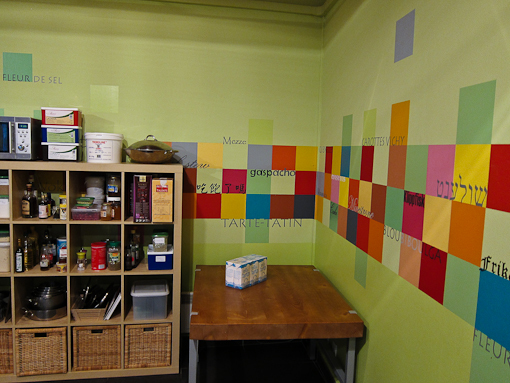 The mural was light and colorful, and went perfectly well with the spring scene outside. 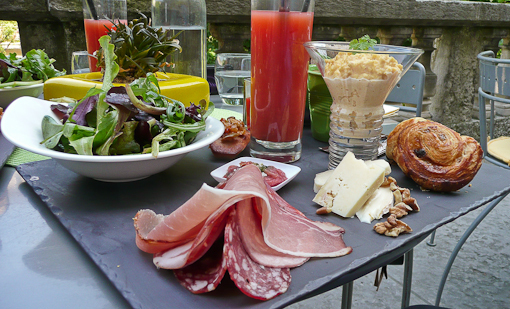 We spent more than two hours there, slowly eating Lyon’s version of “brunch”, soaking up the sun and ambience. 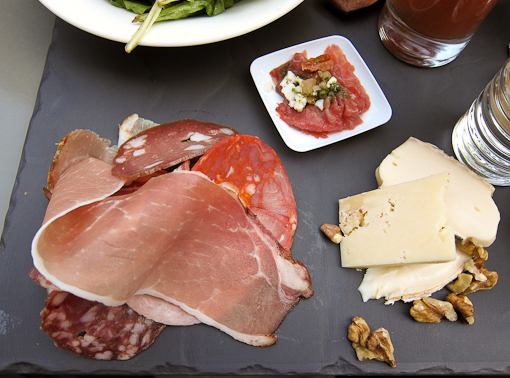 The brunch was a mini buffet of different kinds of dried meat and cheeses, pastries, bread, salad, and other goodies served on a piece of slate, and unlimited hot drinks. The place must be really popular as it was quickly filled up by groups with reservations. It was definitely a “find”. On our last day, we continued our tour of the center of Lyon. 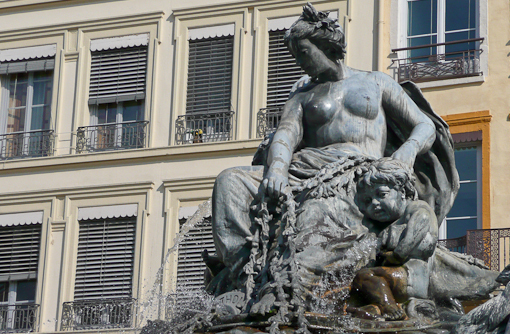 We strolled through the Place des Terreaux which has a big fountain and lots of cafes. The place reminds me of Piazza Navona in Roma. 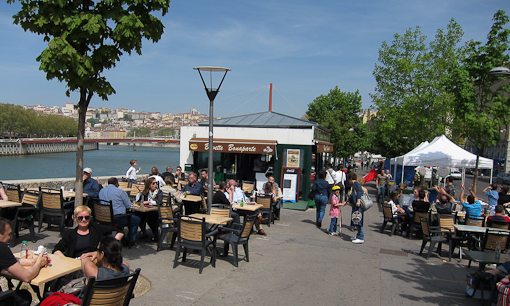 It must be great to have a drink or ice cream here and people-watch on a summer night. 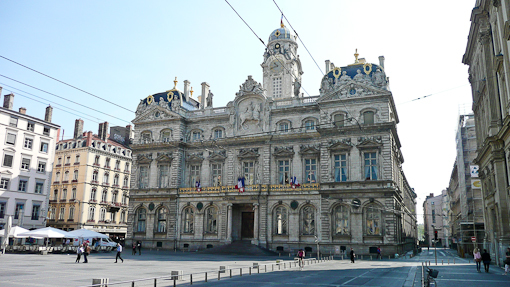 The town hall is on the east side while the Musée des Beaux-Arts de Lyon forms the south side of the square. 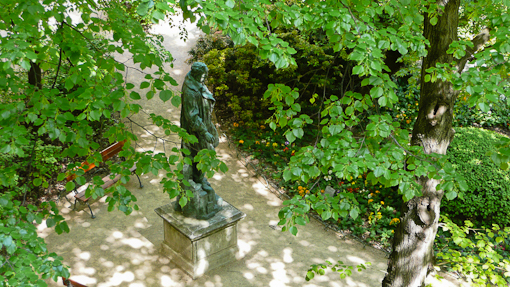 We wandered into the museum and discovered its well-maintained lush green courtyard and garden. 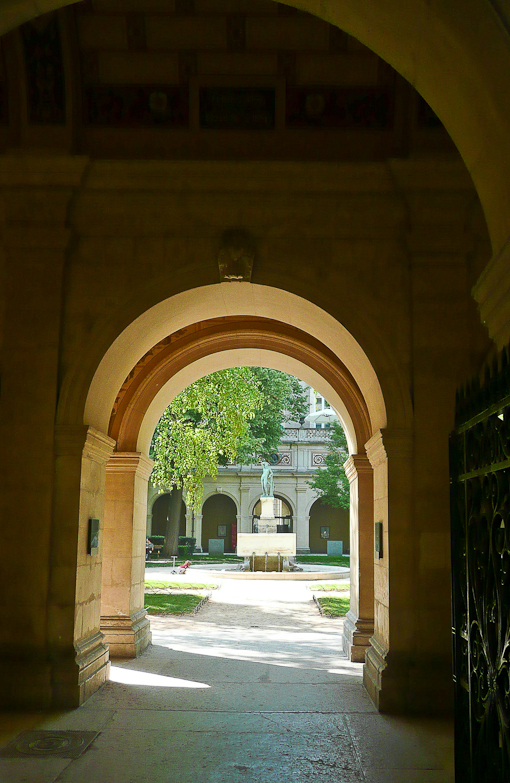 The tranquility of the courtyard is such a contrast from the bustling square just outside. 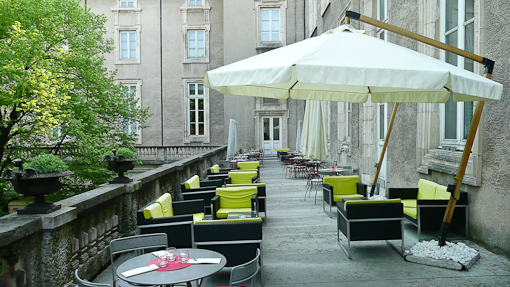 The big discovery is the cafe which is located on the first floor of the museum and the terrace overlooking the courtyard. 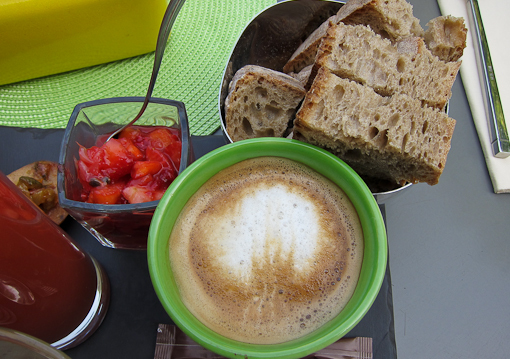 We had an unexpectedly spectacular brunch at the terrace which will be in tomorrow’s post. A satellite map of the museum and the center of Lyon is here. 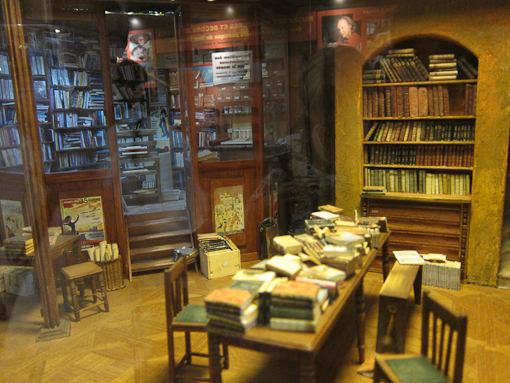 In the old town section of Lyon, we passed by a Museum of miniatures and cinematic decoration. It seemed touristy – we did not want to pay to go inside. 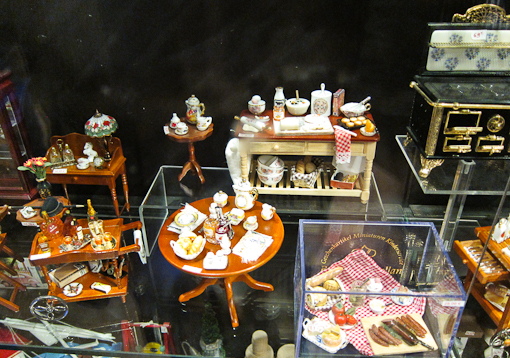 But the museum had several displays in the window and a shop selling micro-sized furniture and crockery. I took some pictures through the glass and some of them turned out surprisingly convincing – just squint a little. 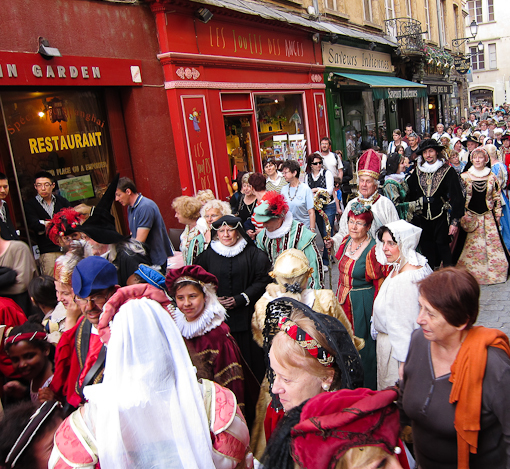 On Saturday, we were surprised by the assembly of people dressed in peirod costume in Place Bellecour (biggest square in Lyon and in France apparently). 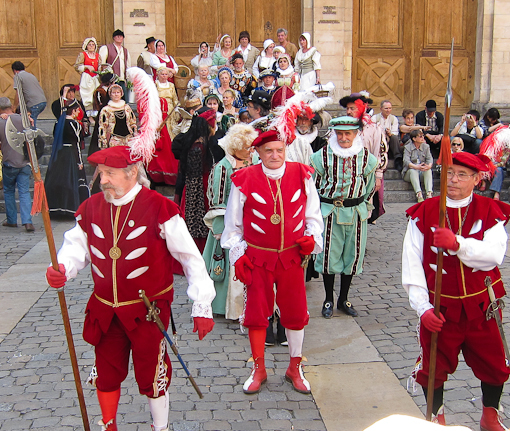 The city was holding its annual celebration of the signing of a charter of rights in 1320, and this year it coincided with the 400th anniversary of the death of King Henry IV. 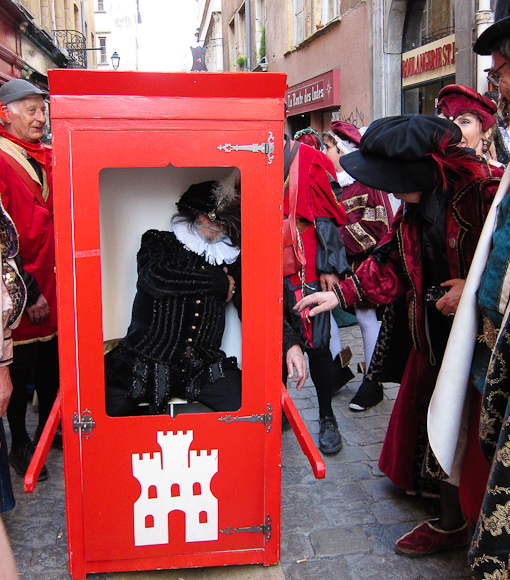 He was apparently a very popular ruler as his assassination and the plotting of it was renacted by costumed actors in various parts of the old town. 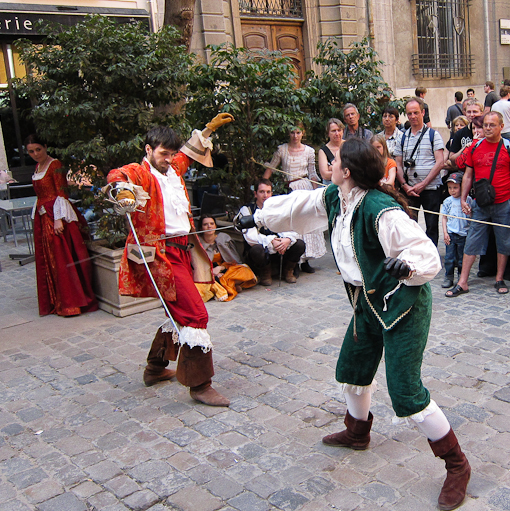 Although it looked touristy, it was not commercial and the participants seemed to enjoy playing the roles as much as the crowd were watching it. 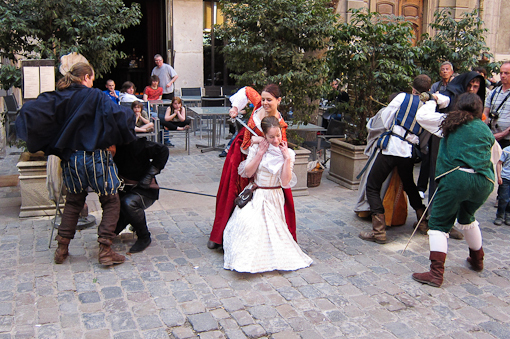 It was fun to watch as the story unfolded during the day (not really knowing what was said by the actors) while we were strolling through the old town. Beside the drama, we saw demonstration of medieval trades, a parade and a performance of dancing with flags. 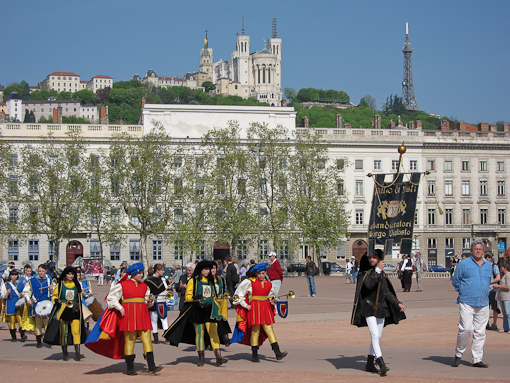 Lyon is the second largest city in France but it is the top gastronomic city. It has more Michelin star restaurants than Paris. So there are lots to explore. 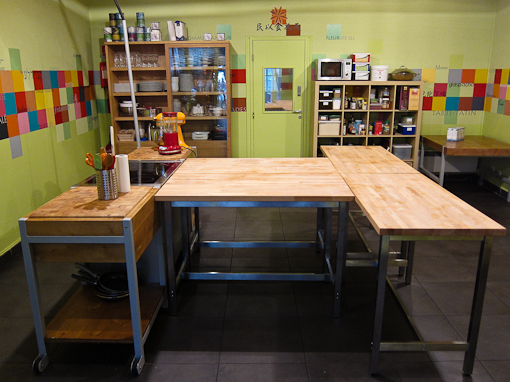 Off the main square in downtown Lyon (Place Bellecour), we came across a small cooking school that has a cafe and cookbook store. 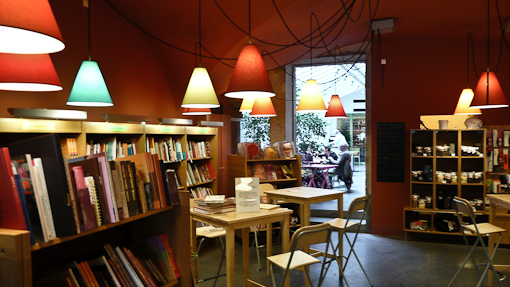 The place is called In Cuisine with a motto “Lire Cusiner Deguster”. 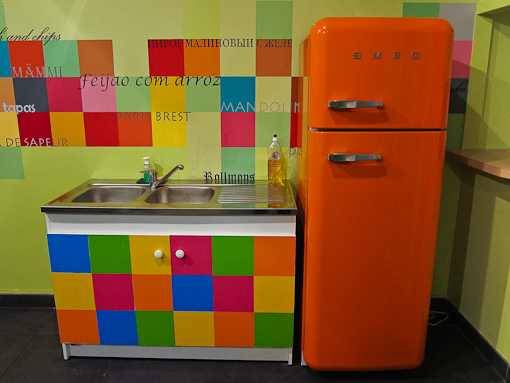 It has a fun and colorful kitchen. 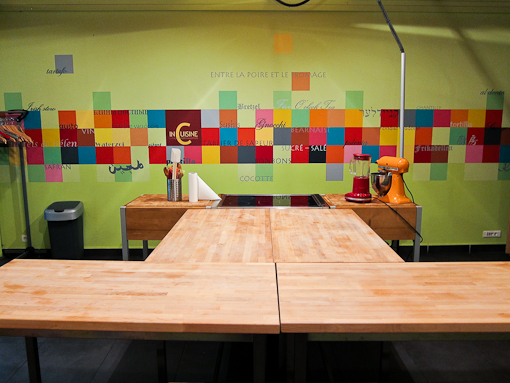 Wouldn’t mind learning some dishes there. We had tea, chatted briefly with the instructor (in English), and continued our tour of the city. 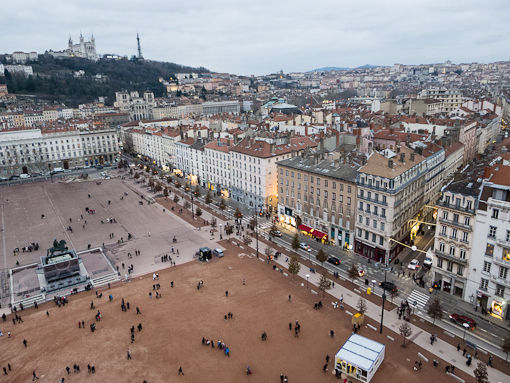 The center of Lyon is located on a strip of land flanked by two rivers: Saône and Rhône. 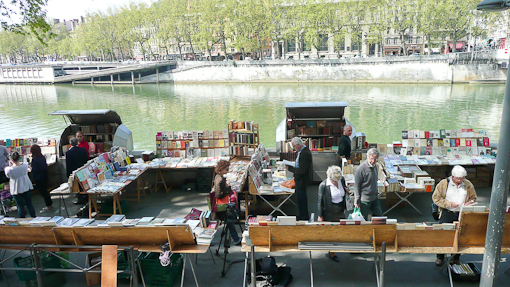 There are markets on the banks of the rivers, selling vegetables, herbs, cheese, flowers, sausages, books, and seafood. 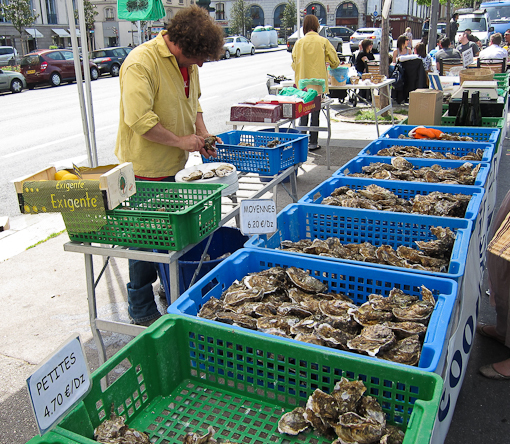 We strolled along the Saône to check out the produce. 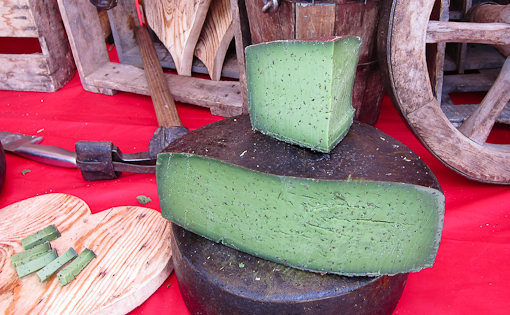 Having never tried pesto cheese before – it was dark green in color, we bought some after a tasting. 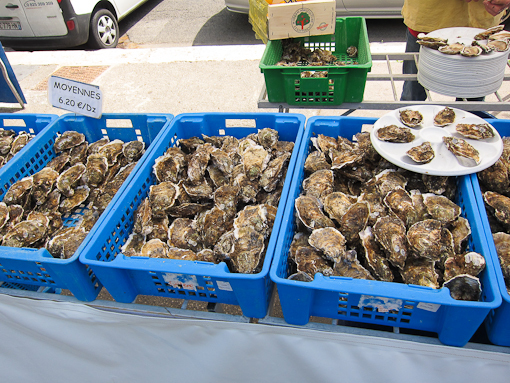 We were also tempted by the raw oysters – 10 euros for 12. We ordered a dozen of them and some cooked prawns. 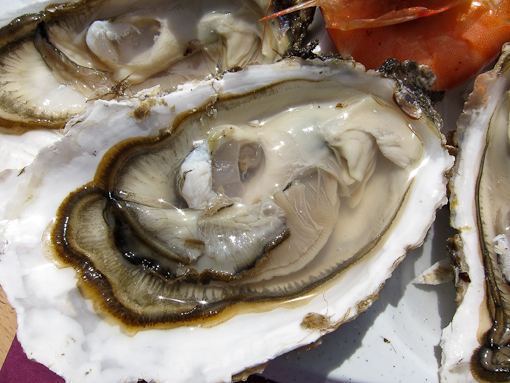 The oysters were shucked in front of us and Sue said one of them was moving. 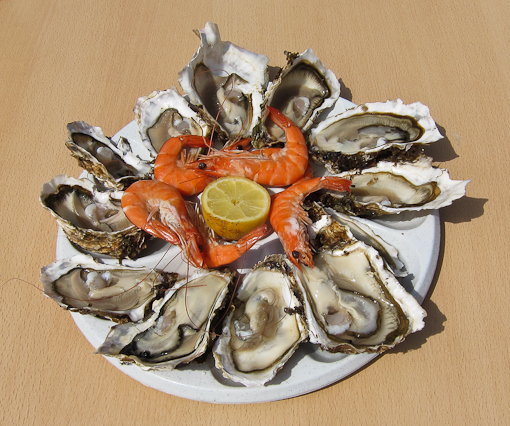 The seafood came from Montepellier down South but it was very fresh. It was nice sitting in the sun, eating oyster, watching the boats go by and the locals doing their weekend food shopping. 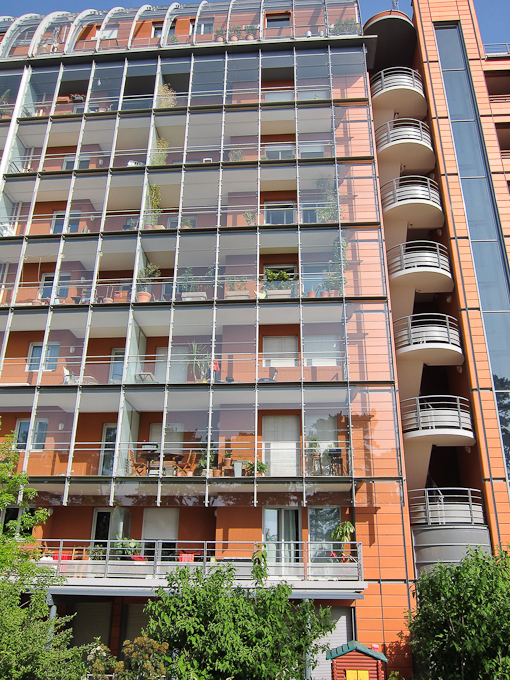 Beside the hotel, the Cité Internationale has residences, a major conference center, a number of restaurants (including a Mexican-themed restaurant ! 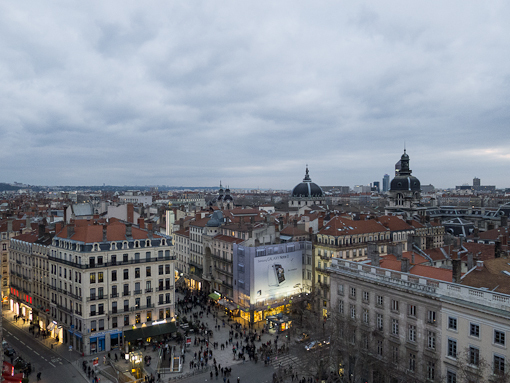 ), a multiplex cinema, a small casino and the Museum of Contemporary Art (Musée d’art contemporain de Lyon or mac-lyon). 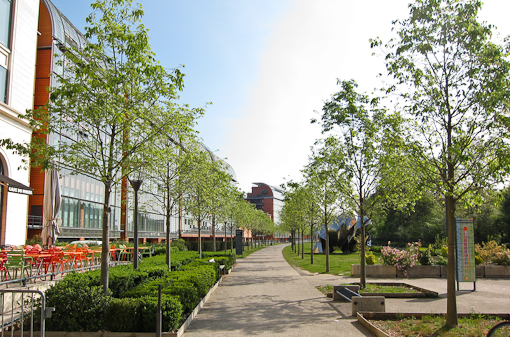 This art piece shown above is placed in the walkway that run through the entire cité. This place has to be one of the safest place on earth since the headquarters of Interpol is situated right next door (picture below). 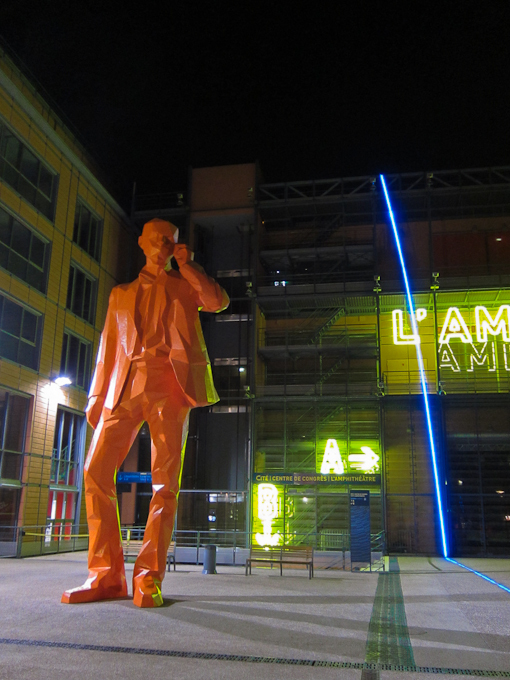 I attended a 2-day business meeting in Lyon towards the end of April. It finished on a Friday, so Sue came to join me for the weekend to explore this city. Neither one had been here before and there is a lot to see and eat. 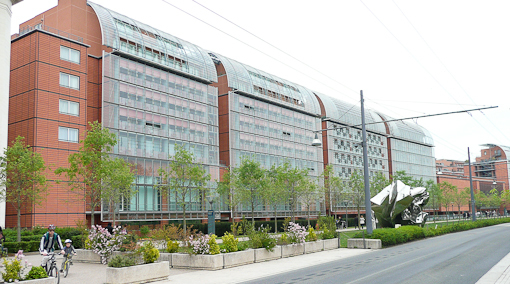 The meeting was held at the Hilton Lyon and we stayed over. In our experience, packing and unpacking to change hotel is a total waste of time. 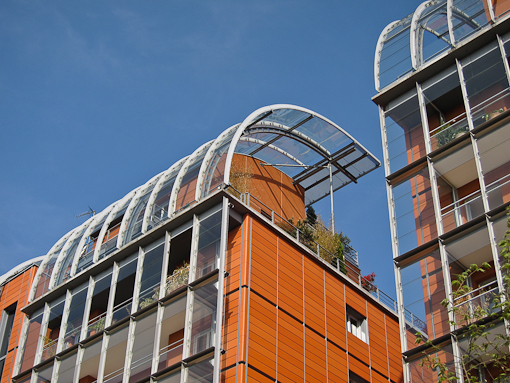 The Hilton is located in the Cité Internationale, an impressive large-scale project designed by Renzo Piano. 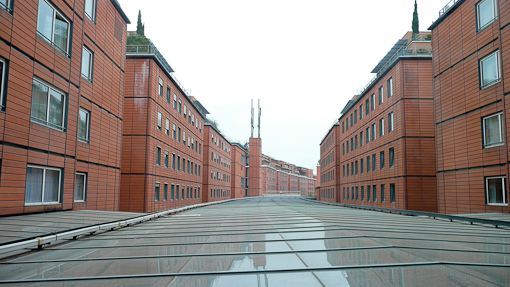 The picture above is taken from the hotel just above the glass ceiling of the main pedestrian walkway. 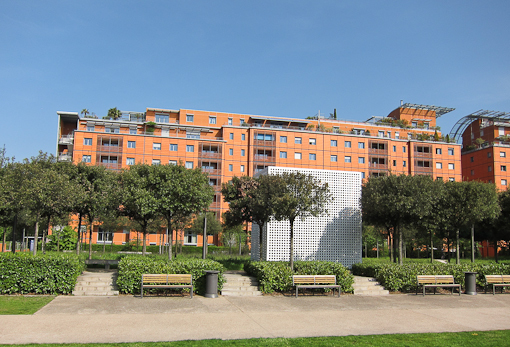 It is located between the Rhone and a big, beautiful park (“Gold head”, Parc de la Tête d’Or). 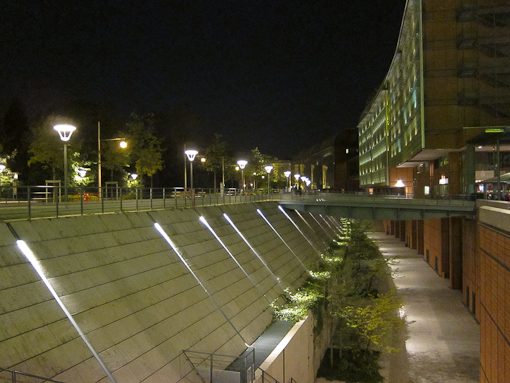 It is a neat place but a bit of a hike into downtown Lyon. More tomorrow.